It’s been some time since I looked at the lower end of the Nikon 1 lineup. I’m overdue at looking at something recent in the J line. Fortunately, the change of sensor from Aptina to Sony made me curious enough to take a close look at the recently introduced Nikon J5. The J5 sits squarely in the middle of the Nikon 1 lineup, with the S2 at the bottom and V3 at the top. The S2 is a very consumerish and can almost be said to be barely more than a compact camera with interchangeable lenses. The V3 is a versatile and feature-full camera that sits at the top of the lineup. What strikes you first when you see an image of the J5—especially the silver over black (panda) version I’m using—is that it looks much more like a traditional camera than previous J’s did. That metal-with-black-leatherette-covering look was a staple of the film era, and seems to be regaining popularity in the digital era, at least with mirrorless cameras. What with the Mode dial, a serious-looking lever, and another dial on the top plate, one might be tricked into thinking there’s more here than meets the eye. Unfortunately the big lever is just the on/off switch, and the dial isn’t nearly as functional as you might hope it to be. Score one for looks over function. As I mentioned, the J5 has a new sensor, basically a variation of the Sony sensor that’s been used in the Sony RX10 and RX100 models, and which tends to test somewhat better than the Aptina sensors used in previous Nikon 1 models. That’s because the Sony sensor uses Backside Illumination (BSI). For those that haven’t been paying attention, BSI means that the light detection cells sit atop the sensor with no power or data paths alongside them: all the electronics sits behind the light collection. The net effect of BSI is to improve the light collection abilities of a sensor, because all of the sensor surface is dedicated to light collection, whereas in non-BSI designs it is not (and relies upon microlenses to focus light down tunnels to get to the detection area). In the RX100 models, when Sony switched from traditional sensor design to BSI they netted a third-of-a-stop advantage to dynamic range. Not a huge improvement, but still a welcome one: small sensors need all the help they can get, and the 1” sensor in the J5 is what would be considered small. And remember, the Aptina sensor used in previous Nikon models was testing worse than the original non-BSI Sony sensor. The implication is that we have improved dynamic range and less noise. Base ISO is now 160, with options up to 12,800 (including Nikon’s strange selection of Auto ISO—yes, we’re still missing Auto ISO at 1600). Other aspects that center around the sensor appear unchanged, which is surprising (I’ll get to why in a moment). We still have 20 fps with autofocus (60 fps without), for example, and we still have what appears to be Nikon’s original phase detect layout intact. In the Sony implementations using this sensor, neither of those things are true: they seem to max out at 15 fps for stills and also seem to have a slightly different layout to the phase detect pixels. Sony has since moved to a Stacked Sensor approach (an additional variation to BSI) and added 30 fps 4K video, but the Nikon J5 has only 15 fps 4K video. It’s not clear to me whether all these things are true physical variations between sensors, or just different methods of running the same sensor, though the 30 fps 4K is almost certainly due to the Stacked Sensor design unique (at the moment) to the Sony RX10II and RX100IV. So what does the sensor Nikon uses give us? 5568 x 3712 JPEG or 12-bit Compressed NEF images, for one. 1080P at 60 frames per second. 4K video at 15 frames per second. 720P at 120 frames per second. Plus a host of smaller slower motion (e.g. 144P/1200; very small video that makes a second of real time last 40 seconds in playback). All the usual Nikon 1 bits came along for the ride, including Motion Snapshot (now at 1080P/60 for one second plus a full resolution still), Smart Photo Selector, Nikon’s WiFi implementation with connection to iOS and Android (and NFC to Android), and even interval shooting. The J series of cameras don’t have eye-level viewfinders (even as an option). They rely upon the rear LCD for composition as well as many other things. The J5 gets a tilting 3” touchscreen. The tilt goes all the way over the camera to “selfie position,” while the touchscreen brings Nikon’s very excellent implementation to your fingertips. Yes, you can touch to focus and take a photo. Unlike any other mirrorless camera, get used to your touch producing instantaneous picture taking. There’s just no delay or hesitation most of the time when you use this feature. Sadly, Nikon has removed the ability to use many of the longer F-mount lenses from the J5. With all prior Nikon 1 bodies, you could mount things like the 500mm f/4 on them using the FT-1 adapter. Now if you try that on a J5 you get a “lens can’t be used” message from the camera. I suspect that this has to do with body changes and how the lens mount is stabilized in the new body design: it can’t handle that much weight if lifted from the camera. Sure, but who would hold the camera with those big lenses on them? A J5 is like a heavy lens cap when mounted on those lenses, and you’d be handling the combo via the lens, not the camera. I doubt that you’d stress the lens mount at all with any care whatsoever. So once again we have an example of Nikon’s nannying coupled with having too many lawyers reviewing things and just saying no. They could have put in the manual: “Be careful of mounting large and heavy lenses on the J5 with the FT-1 adapter. If you attempt to hold the combination from the J5 you may stress and bend the lens mount. Nikon will not repair lens mounts under warranty that are bent this way.” Instead, they just blocked you via firmware. Up top there’s no hot shoe, but you do get a mildly powerful pop-up flash (GN of 21 feet at ISO 160, which should be enough for most indoor uses). Unfortunately, flash sync is a deadly 1/60: you’d better hope your subjects don’t move much. Two bits of bad news: (1) the battery is now the smallish EN-EL24, and the CIPA rating is only 250 shots a charge. This is a step backwards, but it seems Nikon was really shooting for how small they could make the J5, and they’re squeezing a lot of things into that small body. (2) the J5 uses microSD cards, the easiest ones to lose, especially out of a tight battery compartment slot. At 3.9 x 2.4 x 1.3, the J5 gained a little bit of depth to the J4, and that’s mostly due to the tilting touchscreen. At 8.2 ounces, it’s a very light, small camera. The tripod socket is centered, the built-in flash is slightly offset. Price is US$500, including a matching 10-30mm f/3.5-5.6 VR lens. Both camera and lens are made in China. You probably caught a number of handling issues in just my description of the feature set of the J5. At this point four years into the Nikon 1 experiment I think it’s time we all get Nikon’s message: the Nikon 1 is not a truly serious camera line and isn’t designed for serious enthusiasts. Nikon continues to design this camera series in ways that are much more centered in the Coolpix way of thinking, sprinkling in a few features to distinguish them from Coolpix. As you might be able to surmise, Nikon has decided that J5 users aren’t capable of understanding that a control changes during shooting (e.g. command dial changing apertures in aperture priority mode, but shutter speeds in shutter priority mode), but can understand the change between shooting and playback modes. The J5 is full of these simplifications that aren’t always logically consistent. Sure, the dial works once you pressed the exposure compensation button, but your finger is already on the other dial when you do that, so why would you move your hand position to change compensation? It’s also unclear to me whether Nikon has the right priorities in mind when designing this camera in the first place. One thing that struck me as a very strange choice was the order in which the Creative shooting choices are presented (essentially Scene/Effects modes, but not called that for some reason, which means you have to learn new nomenclature if you ever move up to a Nikon DSLR). First up in the Creative mode menu is Pop, followed by Retro and High-contrast monochrome. Four choices down is HDR, six choices down is Easy panorama, sixteen choices down is Landscape followed by Close-up and Portrait. Really? That’s the order in which Nikon thinks you’ll likely want to need them? Of course, Pop makes the camera seem hip, while taking Portraits is just old school, right? If you actually use the camera in Selfie mode (LCD flipped all the way so that it is facing forward above the camera), an interesting thing happens if you haven’t changed the defaults: the camera goes into Selfie mode, ignoring whatever exposure mode you’ve picked, and now automatically triggering Auto ISO and some “program” that picks shutter speed and aperture (and it picks too slow a shutter speed much of the time). You must go to the SETUP menu and set Self-portrait mode to Off to disable this function. Another curious anomaly is this: the mode dial changes the second menu in the system, but the options in the menus are only partially linked. If I set Pop in Creative mode to JPEG, when I switch to Aperture priority shooting mode I’m still shooting JPEG. If I set RAW in Aperture mode, switch to HDR in Creative mode, I get JPEG, then when I switch back to Aperture mode I’m back in RAW. Okay, so if the camera overrode my decision, it will gracefully go back to mine when I leave the thing that overrode it. That’s good. But the second menu choices do have changes between them, so my initial impression was that I should be able to set each of those menus separately. Indeed, I wonder why the common things amongst all those menus weren’t simply moved to a fifth menu. Certainly there’s plenty of room for that on the display (the J5 only has four menus, and the fourth is dedicated to the WiFi connection). I can live with what Nikon gave us in the menus, partly because I rarely change exposure mode, but it’s not the way I would have tried to simplify things. And simplify is a good word for the handling of the J5. In one sense, that’s good. There’s not a lot to learn or to worry about for someone who knows what they’re doing. Too bad about the command dial not working in Aperture priority mode, but the wheel around the Direction pad is okay, if a little small and flimsy in comparison. But we get only one Fn button, and it can only be set to one of seven things (of which the seventh is half scrolled off the menu when you get to it, which I found unusual): exposure compensation, metering, white balance, ISO, Picture Control, AF-area mode, and Focus mode. It’s a good thing we still have the F button and that it brings up a quick menu now. It’s not a good thing that it’s one of the clicks on the Direction pad dial, as I found I accidentally triggered it too many times. On the other hand, the four actual buttons on the back of the J5 are so smooth edged they’re difficult to find by feel (same with the Fn button on the front, but it sits out just far enough that you’ll find it, as there’s nothing else around it). I suppose this indented smooth bit for the buttons is good: none of the four on the back really control anything you’d want to perform while shooting (playback, menu, WiFi, delete). But that leaves the edges of the Direction pad, which quite frankly aren’t discrete enough, to do the “while shooting” job of changing something. Try pressing at 45° on the Direction pad, sometimes I get the quick menu, sometimes I get exposure compensation. While you scoff at that, think what’s going to happen when you try to use this camera in winter with even light gloves on: your discrete touch position is going to be bigger and less focused as you try to hit the Direction pad to change something. The good news is that the touchscreen implementation the J5 uses—shared in many ways with a number of Nikon bodies now, including some DSLRs—is very good. It’s direct, it’s fast, and it scrolls well. I should also note a subtle thing about this UI: if something’s boxed on the rear LCD display, it’s settable directly via touch (e.g. ISO). Unfortunately, not enough things are boxed ;~). So while you can have an image quality indicator on the display, it isn’t active. Ditto with focus settings. I guess the other good news is that the simplification Nikon has embarked on in the J series certainly is understandable and doesn’t cause a lot of confusion once understood. It’s certainly way more understandable than the original J1. But it is a simplification. While the J5 looks more like a serious camera, it wasn’t truly designed to be used like one. To a large degree, the Sony RX-100 has this same problem: something about extreme downsizing in cameras keeps the Japanese thinking that they need to re-invent the wheel (literally) and simplify to an extreme. We’re really seeing recycled compact camera designs now in many of these small cameras. When someone does it differently, as Panasonic did with the LX100, it really stands out. I mention that camera for a reason: it’s not a lot bigger than the J5 with the kit lens, but it’s a much better choice for a serious shooter. Nikon might have hit the target with their J5 design, but I question whether they’re shooting at the right target. Battery: a bit better than I thought it would be. Even doing a lot of touchscreen use and image review, I was getting about the CIPA numbers (250 shots) on my first two battery charges. I suspect that if I had used more flash, that number would plummet, though. But frankly, the battery is small enough that you can easily carry a spare around. Of course, you’ll need to buy a spare. Autofocus: no tangible change that I can see so far (haven’t done a lot of tracking subject testing yet, but enough to make that statement). There may be some small differences, but I haven’t been able to find anything that’s repeatably different against my V3 in the same circumstances. Image Quality: Okay, let’s get this out of the way quickly: it’s a different sensor so we should expect different results. There’s a fair amount to talk about here. Compared to the previous Nikon 1’s, this new sensor delivers considerably more dynamic range at base ISO. It may be as much as two useful stops over the earliest Nikon 1 cameras, though the ISO value is still overstated to reality (actual ISO at marked 160 is a bit less than 100). Those expecting big boosts at the high ISO end will be disappointed, though. Above ISO 800 up the new sensor is better than the older ones, but not enough for me to quantify accurately. A third to a half of a stop, maybe? What impressed me more than the dynamic range change was the color change. J5 images look a bit more “snappy” as they have better color rendering in almost every aspect compared to the J1, and even the more recent V3. DxO Mark has posted their testing results, and if you look at their Color Sensitivity charts—don’t use their overall numbers as they’re a bit arbitrary—you’ll see that there is indeed better color rendering out of the J5 than previous Nikon 1’s in their lab testing. But I should point out that I didn’t need to even perform standardized tests to realize that there was a difference. JPEGs out of the J5 immediately struck me as having more and better color than previous models, and I then immediately started poking around to figure out why (it could have just been a change to EXPEED, after all). Sure enough, color accuracy is improved at low levels with this sensor, because I can see the change in the raw data, too. But it’s more than color accuracy. EXPEED processing also is coming into play with JPEGs, and there I can see a couple of interesting things, too. The J5 images appear sharper than my V3 images, all else equal. It appears that Nikon has backed out a bit of the noise reduction that was in play, so this shows up as some additional edge acuity and contrast. Couple that with the better color information and this explains why I was struck by the snap of the J5’s JPEGs. Moving to raw, things are closer. Once we remove EXPEED from the question we can more clearly see what’s happening at the sensor (though I had to run three different converters to verify one aspect of this). First, yes, color is better in the raw data. Enough so that it will be visible even in raw converters that haven’t finely tuned to the new camera yet (early on, a lot of converters just read data and apply assumed parameters; with more time and experience with a camera, good converter makers adjust via updates to better match the results to the capture; with cameras that aren’t mainstream and high volume such as the J5, this sometimes never happens). Noise is indeed a bit different in the raw data. The thing that struck me most was that color noise—you know, those ugly red, orange, yellow, blue, magenta bits that start to appear—is more under control with the J5 than previous Nikon 1’s. For example, on my V3, I can clearly see color noise starting to break into pixel level visibility at ISO 400, and by the time we hit ISO 3200 it’s un-ignorable and pretty ugly. On the J5, color noise is still somewhat subdued at the pixel level even at ISO 1600. It’s there, but it doesn’t seem nearly as course or objectionable as the previous Nikon 1 cameras. The net result of the sensor changes is that I believe I could drive my J5 at least one stop, and maybe as much as two stops, higher in ISO than I’m comfortable with on the V3. That’s still not in DSLR range, though ;~). Unfortunately, this makes the missing Auto ISO 1600 value so much more of a bad decision on Nikon’s part than before. While I was almost never compelled to go above ISO 800 on my V3, I’d be comfortable pushing the J5 to ISO 1600 in many situations. But I can’t leave the J5 set to Auto ISO and get ISO 1600 as my top value. Dumb. The camera’s JPEG gets slightly blurrier edges due to noise reduction, but the noise isn’t completely reduced. Still, a good result. In this scene, we’re right at the limits of the J5’s dynamic range, maybe just a bit beyond (the sky behind the trees is clearly blown, but I was setting exposure based upon the white framed window on the end of the building). There’s excellent definition in the highlights (water and brighter rock on building), and pretty darned good definition in the deepest shadows (note that you can see the rocks in the water in shadow at lower left). Overall, the J5 is just a bit punchier in its images than the previous Nikon 1’s, plus there truly is more usable dynamic range. No, it’s not full frame DSLR equivalent, but we’re squarely well out of the compact camera range. Indeed, I’d say that some of the J5’s abilities are going to depend a bit upon which lens you put on it. The 10-30mm f/3.5-5.6 kit zoom is pretty decent, but we’re restricting the amount of light getting to the sensor with those aperture values. In the end, the J5 is still, unfortunately, a compact camera design body that takes interchangeable lenses, though one with a bigger and better sensor than you’d expect in a compact. The build quality, feature set, and handling are all best case average for compact cameras. Given that we’re seeing more and more compact cameras with larger sensors and faster focus systems (e.g. the Sony RX100, with which the J5 partly competes), what was unique about the Nikon 1 seres—DSLR like focus performance—is becoming less and less of a standout. Would I replace my Panasonic LX100 with a J5? No. Ironically, it’s also once again lenses that are tripping up Nikon. The 10-30mm f/3.5-5.6 VR that is supplied in the J5 kit is certainly a good performer for a kit lens. But what else are you going to mount on a low-cost, compact-style body? Some will suggest the 30-110mm, but without an EVF, you’ll find that framing and hand holding telephoto focal lengths is not so easy with a really small body. Well, we’re down to two lenses: 6.7-13mm f/3.5-5.6 VR and 18.5mm f/1.8. Yep, both those lenses make sense on the J5. So if you’re looking for a compact camera that can also be a really nice wide angle shooter (18-35mm equivalent) or make for a compact “normal” (50mm equivalent f/1.8), then maybe the J5 makes sense. As a mid-range shooter, I’d rather have (and do have) the Sony RX100IV: it’s smaller, faster in lens aperture, uses a similar sensor, fits in my shirt pocket, can match the tilting sensor and built-in flash, and it has an EVF. 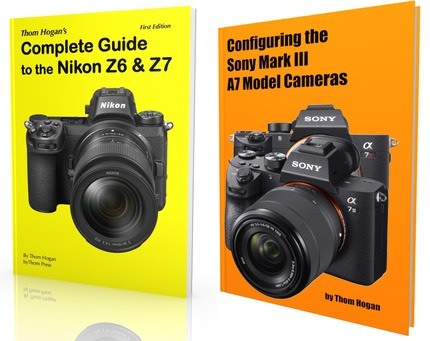 Of course, the Sony is twice as expensive as the Nikon J5, even though they’re using almost twins for sensors. Oh, and the Sony takes SD cards where with the J5 I have to worry about the tiny microSD card (I’ve dropped it more than once getting it out of the cramped battery compartment slot; that won’t work in camp in Africa). In reading the comments back to me after this review was published, I find my “appropriate lens” comments got a lot of pushback. Let me put things this way: if you’re happy with a J1 to J4 with the 30-110mm lens or 70-300mm, then you’ll still be happy with the J5. Nothing really changed in that aspect. However, I’d highly question your ability to get repeatable and reliable results with every snap once you get beyond about 75mm (actual) with this camera. You simply can’t hold it steady enough to get reliable framing and focus, particularly on moving subjects and absolutely if you start moving perspective from eye level. The J4 is not a DSLR. It’s not even a mirrorless with EVF. The J4 isn’t the only camera that has this issue. Canon’s recent G3 X, for example, is another 1” sensor compact style camera that goes to 600mm equivalent with the built-in lens. But trying to hold it without a third brace point and get reliable, repeatable results is once again not truly possible. The difference is that the G3 X has an optional EVF, giving you the potential to better brace the camera and keep it locked onto a distant subject that might be moving. You might be able to carry a load of wood in your hatchback, but it isn’t optimal for the job. Get a pickup. The same is true of the J5. Its design targets someone different than the 70-300mm lens user (and I’d point out again that the missing Auto ISO 1600 is going to factor in if you’re shooting at f/5.6 all the time). One would hope that a V4 using the J5 sensor will appear, which would potentially address this issue. Still, small, light cameras with 800mm equivalent focal lengths aren’t a panacea; they’re still a bit of a compromise. To me, the J5 is a compromise too far. I really wanted to like the J5, especially after I saw the improved image quality, but at best I can only get lukewarm about it. The swivel touchscreen and small body size are nice. The new style looks more traditional and upscale. The focus system is still exceptionally good, as are some of the unique Nikon 1 features such as very fast frame rates in burst shooting. But Nikon is still wrapping the good stuff in dive-to-the-bottom photographic controls. Other than the Mode dial and modestly customizable Fn button, this is a stripper model (to use automobile parlance): small and minimal controls, arbitrary feature set reduction and simplification, and some poor choices in implementation still mar the Nikon 1 experience for any remotely serious shooter. If you’ve got a J1 through J4 or S1 or S2, sure, the J5 is a step up for you simply because of the image quality. For those of you looking for a highly competent compact camera, maybe the J5 is the right choice for you, especially if you mostly shoot in the midrange focal lengths but shoot faster moving subjects. For the rest of you, I’m not so sure you wouldn’t be better served by a different camera. But here’s the kicker. As I write this, you can get a J5 with kit lens for the same price as a D3300 with kit lens. If image quality and handling are at all an issue, the D3300 is a no-brainer choice. Thus, we get into the J5 being “good enough” in image quality and “just enough” in terms of features and handling, but far smaller and lighter for the same price as the DSLR. In other words, you have to really want the smaller and lighter aspect of the J5 over the D3300, because you’re paying for it. And so once again I find myself lukewarm about a Nikon 1. What’s frustrating is that it wouldn’t take a lot to move the bar well past that, but Nikon doesn’t seem to want to move the bar.